"There's always pain," explains Wolverine to Yashida, a young Japanese officer whose life he saved while a prisoner during World War II. Both for Wolverine, someone whose mutant powers of healing is triggered by pain, and for fans of his movies, pain is a thing to endure. A superior follow up to the miserable dreck of X-Men Origins: Wolverine and a sequel to the putrid X-Men: The Last Stand, James Mangold's The Wolverine is a splendidly photographed, more accomplished motion picture than those two predecessors. There are sublime homages to the films of Wong Kar-Wai and Ridley Scott, and yet The Wolverine still leaves one feeling brain dead as if shot in the skull with an adamantium bullet. Wolverine was present during the bombing of Nagasaki, stuck in a well and forced to reveal himself as a mutant to his captor Yashida. This act of heroism turned out to have major ramifications for Japan. Yashida (Hal Yamanouchi) went on to become that nation's richest and most powerful industrialist. Now on his high tech death bed, Yashida summons Wolverine from the cave in the wilds of Northern Canada he was living in to Tokyo, offering to use his technology to rid Wolverine of his mutant healing factor, and thus the "curse" of immortality and being forced to continue on after all your loved ones die. 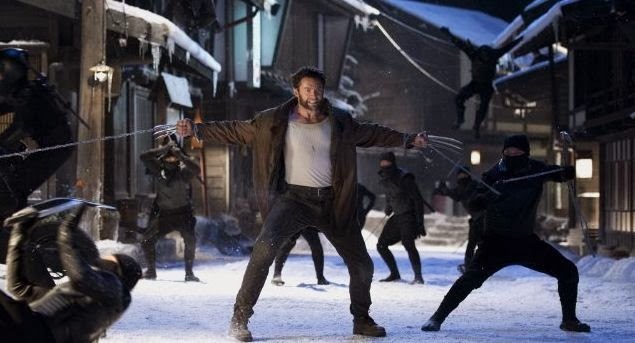 Wolverine impolitely refuses and soon finds himself embroiled in a bizarre power struggle involving Yashida's ignoble son Shingen (Hiroyuki Sanada), his granddaughter Mariko, a corrupt politician, the Yakuza, and a cadre of ninjas called the Black Clan. An assassination attempt on Mariko, the chosen heir to the Yashida empire, sends Wolverine into Protection Mode, and sends the movie into a cycle of repetition: Wolverine and Mariko run, she gets kidnapped, he saves her, she gets kidnapped again, he saves her, she gets kidnapped again, he saves her again. Every Japanese with a Y chromosome hates Wolverine on sight and tries to kill him, usually while calling him a "gai-jin." Naturally, the two Japanese with X chromosomes in the movie take a shine to Wolverine: Yukio (Rila Fukushima), a cheerful sprite of a deadly warrior who can see the future, and the radiant Mariko (Tao Okamoto), who takes her time falling for Wolverine, though fall for him she must, as Mariko is one of Wolverine's great loves in the comics. Unfortunately, Wolverine is haunted by the Phoenix Force Ghost of his other great love Jean Grey (Famke Janssen), who appears whenever he falls asleep and urges him to shuffle off his mortal coil and join her in the Great Beyond of Sexytime. "Who is Jean?" Mariko repeatedly asks Wolverine, who cries out in his sleep every night. Though he honors her with no answers, Wolverine still pops a bone claw in Mariko's loins, but he isn't so devoted that he decides not to bail out of Japan on the first corporate jet available. Yukio and Wolverine's Marvel Team Up sequences are the most fun and energetic, but Yukio is disappointingly benched for half the movie while Wolverine lengthily absconds with Mariko. The Wolverine's super villainess, the Viper (Svetlana Khodchenkova), is a green suited, acid-tongued cypher. In a movie where everything the evil Japanese are doing is confusing, the evil white mutant lady's motivations for why she does anything she does are the most inscrutable of all. The Wolverine's main novelty beyond the exotic Japan setting is denying Wolverine his greatest asset, his mutant healing factor, for most of the movie. Apparently, a tentacled robot thingie grappled to his heart can suppress a mutant's powers. Now "vulnerable," or as vulnerable as Wolverine can be while still possessing a skeleton grafted with adamantium and deadly razor sharp claws, Wolverine is shot and stabbed repeatedly, suffering every injury without his usual insta-fix-it. This really does a number on Wolverine's swagger; he's a limping, bleeding, shell of himself for most of the movie. Wolverine performing open heart surgery on himself to destroy the tentacled robot thingie while Yukio has a samurai sword fight with Shingen is probably the most bonzo bananas action sequence in any X-Men movie thus far. Even after his healing factor is returned to him, Wolverine reveals he's no tactical genius -- stomping into a trap laid by dozens of ninjas with no plan and getting captured. The Wolverine later neuters Wolverine again by eliminating his adamantium claws, though he does regenerate the bone claws beneath the metal. Playing Wolverine for the upteenth time, Hugh Jackman is more chiseled than ever. Apparently, FOX opted not to go with the full title: The Wolverine Takes His Shirt Off Repeatedly. Jackman also has better Wolverine hair than ever, and by now has Wolverine's surly ferocity down cold. The Wolverine forces Wolverine to confront weighty issues like the cost of his seemingly eternal life, his commitment to a world that hates and fears him, his guilt over being forced to kill the insane Jean Grey, and the love of two women, and yet Wolverine remains distant and stoic. He takes perfunctory action when called upon and endures inhuman amounts of punishment, yet there's no passion or burning ember in Wolverine. He's certainly not loquacious. The Wolverine's reveal that his old friend Yashida is in fact the true villain behind all of his troubles, trying to steal his healing factor while wearing a giant Silver Samurai robot suit (the Japanese and their giant robots...), is as cynical as it gets: to Yashida, Wolverine, the man who saved his life, is a commodity to exploit and nothing more. In the requisite Marvel mid-credits scene set two years later, Wolverine meets a resurgent Magneto and an inexplicably alive Charles Xavier, setting up next year's X-Men: Days of Future Past, speaking of commodities to X-ploit.